"Noble's commitment to the individual trader is exactly what traders need during these volatile times. He has knowledge that spans across markets and is worldwide. He is a valued contributor to the TraderPlanet.com community, and this book further demonstrates his dedication to educating traders and helping them become more successful." "In a time when, on a global level, important things are happening to the financial industry, when new profit opportunities as well as risks are revealed, the book Trade Like a Pro offers a complete picture concerning the risk administration techniques." "Trade Like a Pro is a comprehensive presentation of all the basic trading strategies that belongs in every investor's library. Whether your specialty is futures, options, or stocksor, for that matter, a combination of all threeyou will find yourself going back to this valuable reference guide again and again. Everything rings true. Moreover, the author gives you the pros and cons of each respective strategy without imposing his own point of view. Well researched and presented." "Armed with good intentions, most new traders are unaware of the realities involved. Although there is often the belief among novice traders that profitability will be easy, the evidence strongly suggests otherwise. 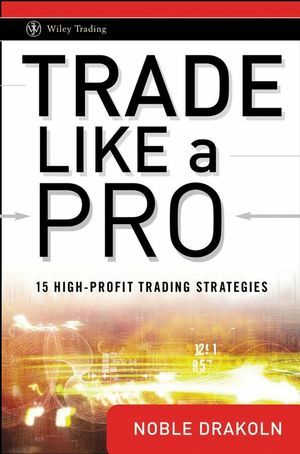 In his new book, Trade Like a Pro: 15 High-Profit Trading Strategies, Noble DraKoln offers a thoughtful approach to making the transition from unsuccessful retail trader to the arena of the professional, which is imperative for lasting success as a trader." Noble DraKoln is founder of SpeculatorAcademy.com, a futures and Forex educational company, where he focuses on the development, management, and promotion of the company's core philosophy of "focusing on the trader not the trading." Prior to this role, DraKoln served as the president of Liverpool Derivatives Group, Inc., a futures and Forex brokerage, for eight years and as a professional sugar trader. He speaks regularly at industry conferences in the United States and Europe and has written articles for numerous financial publications. DraKoln is also an NFA Arbitrator, as well as the author of the Wiley title Winning the Trading Game. Part I. Designing the Trade. Chapter 1. From Retail Trader to Professional Trader. Transitioning from Retail Trader to Professional Trader. Tightening up Your Approach to the Markets. Chapter 2. Markets and Margin. What Do These Changes Mean for Your Trading? Three Different Types of Traders. Using This Book to Its Fullest Potential. Chapter 4. Holding the Bull and the Bear by the Tails. Getting the Right Options for the Job. Sample Straddle and Strangle Write-up Sheets. Chapter 5. Precision Trading at Its Finest. Chapter 6. Trading with Hard Stops. Options as an Alternative to the Stop. Chapter 7. The Markets on a Leash. Chapter 8. Replacing Traditional Options with Synthetic Options. Synthetic Option versus Standard Option. When to Use a Synthetic Option. Chapter 9. Everything in its season. Chapter 10. Gunning for Premiums with Covered Options. Chapter 11. Outflanking the Market. Chapter 12. Exposing Yourself to Loss. Synthetic Futures, Long – Short. The Bull Call Spread and Bear Put Spread. Chapter 13. Advanced Option Selling Strategies. Do 90% of Options Expire Worthless? What to Expect When Selling Options. Strangles, Straddles, or Naked Options. Chapter 14. Retreat, Recovery, Opportunity. Chapter 15. Analyzing Charts and Strategies. Chapter 16. Applying These Strategies with Stocks.